I know everyone is getting into back to school mode, and some teachers start back to work at the beginning of August. I went to my school yesterday to get everything arranged and take pictures but they had not waxed my floors yet...boooo. It will be about 2 more weeks they think. I have a project to share with you in case you have not finished decorating your class. I love those tissue paper poms. 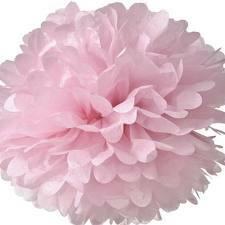 I forgot to take pictures of the poms I made but they turned out just like this. I was shopping at the craft store and saw kits to make them but 'Whoa, hold the hot sauce' were they expensive or what? I couldn't imagine they were that hard to make so I went about searching the internet and found an awesome how-to video on You Tube. The gal that created it bought her supplies at Michael's but I found tissue paper that worked great from the Dollar Tree. I have read directions that call for 8 pieces of tissue paper, but if you want nice full poms try making them with 12 sheets. make sure you have sharp scissors so that you get an even cut at both ends of your folded tissue paper before you 'fan' it out. I had one hanging over each of my tables last year and they look super cute! I made new poms for this year to match my color scheme of my classroom. Here is a helpful video if you want to try it yourself. I love making those! We used to make colored ones, attach them to green pipe cleaners, and call them flowers!